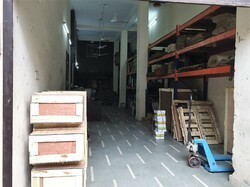 The state-of-the-art warehouse at our firm is known for the systematic storage it enables. Ideally compartmentalized and well equipped stacking as per ISO standard are taken care, it is safe from fire, water and various other damaging factors properly maintained. Further, it is disinfected on a regular basis, for the purpose of preventing insect infestation. Taken care of by highly skilled professionals, it enables efficient inventory management. The offered products are always kept in an organized and clean manner in our well-equipped warehousing facility. It is located at a strategic locations with fork lift, EOT overhead electric hoist & pallet trucks for easy mobility of heavy machinery. All the products provided by us in the market are procured from some of our highly reputed and trusted vendors, for enabling the maintenance of desired quality standards. These vendors engage in using the finest raw materials and machinery for manufacturing their products. Their manufacturing processes are carried out as per the set industrial norms and guidelines. Owing to this, the products functionality and life span is commendable. Post the manufacturing, these vendors process the products through a number of quality tests for the purpose of quality standardization. Further, the vendors provide timely delivery of all the products.